If you are looking for a fun game, you can install Minions Paradise APK 9.1.3207 on your smartphone. As you know that smartphone is used not only to make your work easier, but also to provide you good entertainment. Moreover, minions that are popular through ‘Despicable Me’ movie have many fans from kids to adults. Then, this game must be loved by many people. You must know that, there is a minion game before that is named minion rush. In this game, there is new character of minion which is Phil. 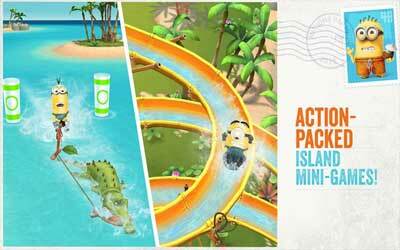 However, minion paradise has different plot of game that is also fun and exciting. On the opening of the game, the story begins with Phil who accidentally sinks a ship that brings the servants which are the minions. However, all of them are safe and washed ashore to an alienated tropical island. Then, you must help Phil and the other minions to build a minion paradise on the island. Hey, party people! Keep your paradise in play with the latest update, where you’ll find new levels and enhanced gameplay. Also, some behind-the-scenes improvements are sure to keep Phil and the gang in high spirits.